OEMs are demanding safety-readiness for more components, altering the dynamics of the design process. The ISO 26262 spec is a household term for anyone even remotely involved with the automotive industry today. Increasingly, though, it is being used interchangeably with safety-readiness across the entire supply chain. ISO 26262 compliance is a prerequisite for IP and chips used in an increasing number of automotive applications. It applies to systems, software, and to individual products. And because failover mechanisms are tied to other systems, even non-critical systems are being drawn into ISO 26262 compliance. That requires planning, and a different way of thinking about design. Given the diversity of the automotive supply chain, OEMs generally capture safety and other requirements in specifications broken down by system. Also, ISO 26262 compliance requires robust computation of several hardware metrics, including single-point fault metric (SPFM), latent fault metric (LFM), and the probabilistic metric for random hardware failures (PMHF), noted Jörg Grosse, product manager functional safety at OneSpin. 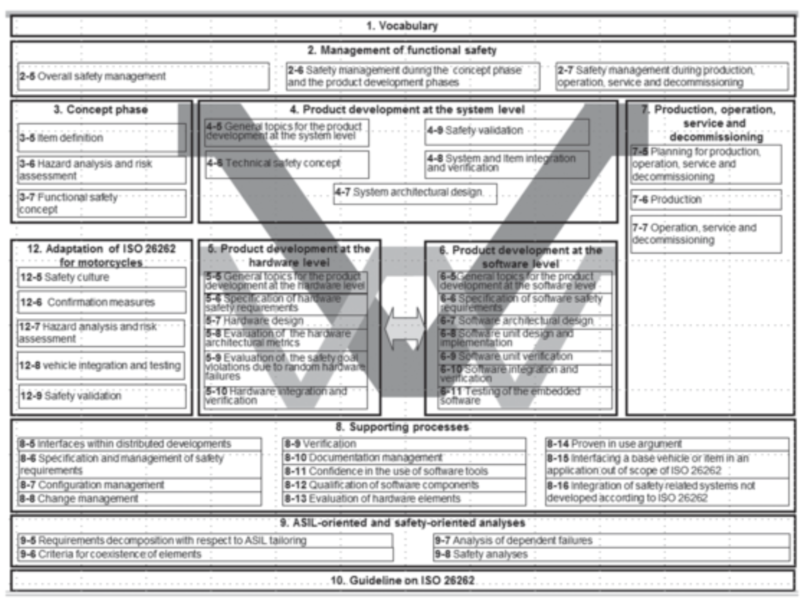 “Typically this is done within the FMEDA, which is owned by the functional safety engineers. We are observing confusion and increasing effort when it comes to computing those metrics for SoCs because tasks are pushed across to the functional verification teams without clear methods or tool flows. Massively increased chip size, shrinking geometries, and higher frequencies are imposing new challenges for compliance, such as new classes of failure modes. Innovation and re-assessment of current flows and methods are needed to ensure that crucial resources are effectively used and to prepare for these new challenges,” he said. Because of this, most of the IP created within the semiconductor industry by the ingredient providers is designated by ISO 26262 as a safety element out of context (SEOOC), specifically because a system technically is the only thing that can have an ASIL level, Shuler noted. Beyond the technical aspects, playing in the automotive world means methods and people are analyzed, as well. Adhering to tight safety protocols means new questions are asked of the design team in order to deal with the systematic errors. “How do you design quality into the product? How do you design safety into the product? How do you not do things that are going to cause gaps that could lead to a future safety issue? When people start getting assessed within the value chain, it’s usually the person above you. But it also can be a third-party assessor that your customer hires, or that you hired yourself. People are surprised because they spend more time, or as much time, looking at your quality processes and how your people are trained. They’ll go to a verification engineer and ask, ‘What do you do when you have a bug reported to you? How do you know it was closed? How do you know it went into the proper release of this particular thing?’ They’re looking in detail at the people, and whether they can do their jobs, and whether you have a process to enable them to do their job? That is at least half of the assessment. It’s not just looking at the speeds and feeds,” he said. The scope of automotive design that includes safety and reliability has become so big that it must be addressed in a very different way than it has in the past.